I don't often restore Victorian clothes mangles unless they are something very special as they are such a labour of love to do. This mangle was in such good condition, only 3/4 size and originally purchased from Harrods in London, so makes it easy to place as an interior piece. It has never been outside as all the rollers etc are in excellent working condition. I have taken it apart completely and repainted and polished it back to it's original colours. Amazingly the paint company could look up the Harrods colour mix exactly as it is a branded colour! 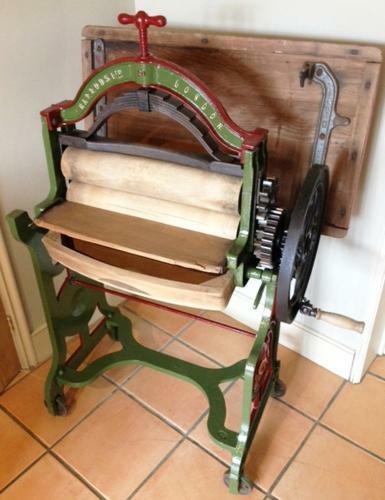 This mangle has the classic oversprung design more typical of the Victorian models. Realeasing two clips allows the mangle to fold down on itself thus creating a pine table. Note the table top comes off easily should you wish to display it without. Clothes mangles are heavy but this one would go in the back of an estate car. Would look great in a kitchen, hall or conservatory or as a shop display etc.